A luxurious main office and additional parking were built on the new property and the original offices were converted into working space. The new shop now sits atop a 27,000 foot lot with 12,500 feet of working area and plenty of open air space and parking. Each step of the expansion process was done with an emphasis on serving the customer. 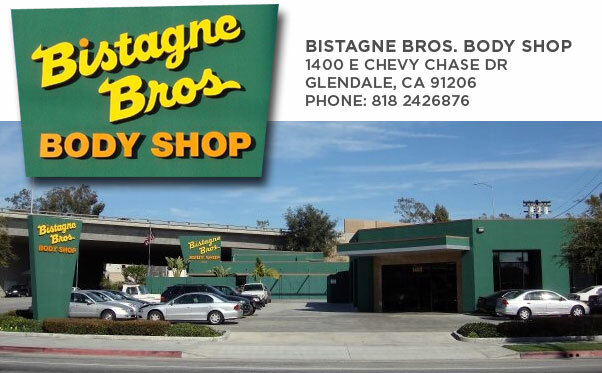 From the ease of access from the two major streets to the open environment and comfortable waiting area of the office, Bistagne Brothers maintains a very customer friendly atmosphere. The shop area now utilizes the latest technology and equipment to carry out state of the art automobile repairs. Well trained staff ensure that the customer’s vehicles are repaired to proper factory specifications; and paintwork is perfectly matched. Every car is thoroughly cleaned and washed prior to delivery. Every vehicle is inspected to insure full customer satisfaction. Local shuttle service is also available to make the customers experience as enjoyable as possible. Staffing grew from the two original workers (Tom and George) to seventeen employees including skilled painters and technicians. In our waiting room, we have free Wi-Fi, and offer free local pick-up and drop-off service. We want our customers to feel that they can come back to us if anything needs additional attention after we return their car to them. As a result, we have some of the best warranty periods in our industry. We at Bistagne Bros. are proud to offer a Lifetime Warranty on all of our work. We stand behind every repair we complete. You can rest assured that should anything happen to the repair we completed, we’ll make it right. All replacement parts carry manufacturer’s warranty. Of course, some things are outside of the warranty such as normal wear and tear, and damage from subsequent activities. Contact our office for full details.